Do you like horror (of course you do)? How about an almost entirely LGBTQ cast with LGBTQ developers (this is getting obvious)? Now let’s make it a visual novel with heavy sci-fi elements and maybe also a dating sim. This is the concept of Love Shore. 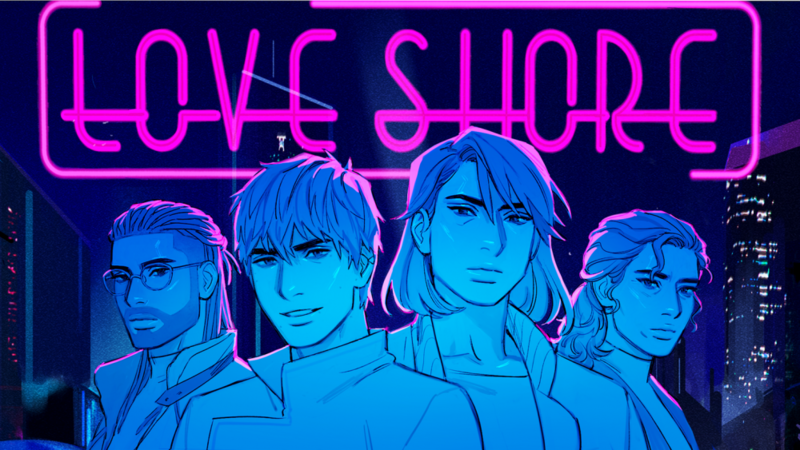 Taken from their Kickstarter, “Love Shore is a visual novel game that takes concepts we’ve always loved in sci-fi, action, and horror and blends them together to create something wild. It features a queer, diverse cast, a seemingly endless city, and a story of coming into yourself and doing what you think is right…with a heavy dose of drama and violence mixed in for good measure”. A demo is available and they have met their goal for Kickstarter! However, that does not mean the work is over and we were able to get a chance to talk to Emmett and Son from the development team about the history of the game and where to go from here. GenderTerror: Let’s start with the basics. Names and your involvement with Love Shore. Emmett: Hey, I’m Emmett! I’m one half of our production and writing team, creating Farah’s route in the game. Son: I’m Son and Love Shore came from my horror brain. I write Sam’s route! GT: Love Shore sports an almost entirely LGBTQ+ cast. Was this always decided from the beginning or how did this come to be? E: It was pretty much a given that the cast would be majority LGBTQ. The idea of a non-heterosexual dating sim was always baked into the creation of the game. S: It wasn’t even discussed considering the developers (us) are nearly entirely LGBT+ and all of our studio, Perfect Garbage, is. GT: Where did the story come from? E: Son approached me with the concept for the story that would become Love Shore! It started off as a part of their own work. In splitting up the story, things changed and grew quite a bit. S: Surprisingly, Love Shore started off as a city in my horror story TEETHING but I loved the world so much I had to invest in building it outside of it. And telling it through a visual novel made it perfect to explore! GT: Horror elements are hinted at. What can you disclose without giving away some spoilers? E: There are some pretty classic horror elements incorporated, and Love Shore did start off more strictly based in the horror genre. There’s absolutely psychological horror incorporated, and the characters are all pretty deep into the mysteries surrounding the city itself. There’s themes of betrayal, and some seriously tense scenes, and in Farah’s route in particular, there’s some medical horror involved. I’m a huge horror fan overall, and there’s a huge amount of narrative tension that comes from the Hitchcockian idea of the scariest monster of all is the one that you don’t see in its entirety until the very end. S: Well, I’m obsessed with horror. My favorite horror is the horror of the self. What if we are not who we think we are? How do we know we are real? That’s often brought up in Love Shore. There’s cosmic horror as well, with the gods showing their true forms, which take fantastical shapes. There’s horror in the thriller aspect, as there’s some rather intense scenes that would require players to think quick to get out alive. And lastly, there’s the horror of violence. Nothing too gory but I do love the chance to get into the meat of things. GT: How did Love Shore get to a dating sim in some form? E: I’m a huge fan of media that incorporates a twist on genre. So incorporating dating sim elements into a what was initially a cyberpunk-horror visual novel seemed too fun to pass up. Having a mechanic that emphasizes relationships makes it fun for the player and also puts your audience in a position of being invested in your cast so when stuff hits the fan, the effect is really felt. S: We really wanted to hit the being gay and doing crime. Jokes aside, the dating sim element also allows us to really dive into a multitude of views in Love Shore. No single character as the same experience, and we wanted players to feel that. GT: Favorite factoid/tidbit about the game or characters? E: My favorite tidbit about the game itself is the fact that we effectively are interweaving ten characters’ stories around a select few major plot points. I love the fact that we can pull in a big cast around the game’s major themes: What makes a human a human? Can you transcend humanity? Not for nothing, but I also love the fact tat we have transgender characters who are both humans and S.Humans; seeing that difference is super cool as a trans creator. S: My favorite bit about Love Shore is that despite being on opposite spectrums of their involvement of Love Shore, Farah and Sam’s stories are intertwined. They happen simultaneously in game, and affect each other based on the choices the player makes. I love that Farah, with Imani, dives deep into the history of the city and Life.S. And on the other side, Sam’s route falls to learning about the underworld of the city and the factions that control it. Both deal with similar plot points but from two completely different perspectives. And the characters have strengths in different aspects. It’s like playing the game with a new lens when you switch characters. GT: Was it easy or difficult to write such an interconnected story for the cast? Multiple play throughs will be required if someone wants to get the full story, correct? E: It’s definitely an exercise in communication and patience writing an interconnected storyline with a co-author! I have a lot of fun with it, though. You can get a very detailed view of the story if you do one play through. We don’t wanna cut out people who’ll be picking up the game casually….but the full story does necessitate multiple play-throughs of both routes, in my opinion. S: You will always find something you missed. And working with someone only helps us get better at adding those finer details. GT: Favorite character and why? You cannot pick Farah or Sam. E: It’s tough, but I have a total soft spot for Talia. She’s the one whose story I’m most excited to write, and having a human in these crazy positions where they’re learning about supernatural stuff and dealing with cyborgs is just so fun to write. S: Alyosha! His storyline is filled with some sinister twists and really brings up all of Sam’s flaws to light. He’s a great foil. Alyosha is also motivated darkly by revenge, a clear juxtaposition to his kind and forgiving side. Plus, he’s from the past and therefore, hilariously confused. GT: Will there be any Love Shore supplemental materials? Short stories, spin offs, etc? The world seems vast enough to explore outside of Farah and Sam. E: One of our stretch goals for the Kickstarter is a brief prequel comic about Farah and Sam’s lives before the events of the game, and we’d really like to write that too! Nothing else is planned at the moment, but who knows what the future holds. We’re focusing on finishing the game at the moment, though. 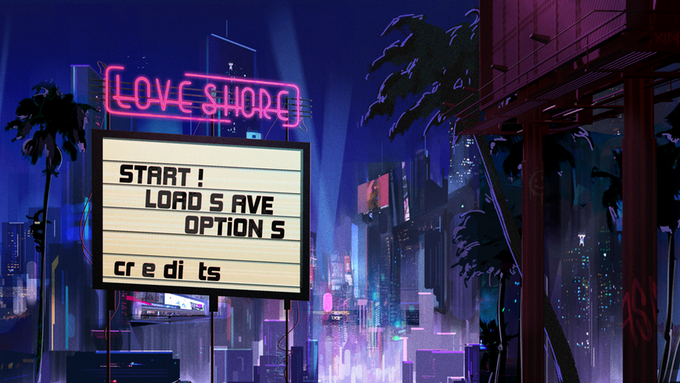 S: Love Shore is a huge world filled to the brim with interesting characters and settings. We’d love to dive even further into it one day but I think baby steps are important. We’re a small indie group and want to put all of our energy into making the game! GT: Congrats on meeting your Kickstarter goal! Where to go from here? E: Thank you so much! I’m gonna fully turn off my phone and log out of every social media for like, 24 hours, and then we’re back at it. We’re hoping to reach some of our stretch goals right now, and that’ll just help us even more with creating a fantastic game. S: A nap, please. I have been helicopter mom-ing this whole time and my eyes need rest. But just as Emmett said, a brief moment to breathe and recollect ourselves before diving in. We plan to keep everyone posted on our progress during our journey! Please consider following the development of the game on Twitter, as well as supporting them on Patreon!